High winds cause water rescues, power outages and more. Fast moving storms through North Texas on Saturday evening ended up putting some people in peril. Dallas Fire-Rescue responded to 4-5 water rescues around 7:30 p.m. Saturday. By the end of the night, there were no reported injuries, deaths or missing boaters. But there were some anxious moments. Dallas Fire-Rescue spokesman Jason Evans said crews rescued two people from a 24-foot pontoon boat that was stranded. Firefighters also rescued a boat that hit the rocks near a dam. The passengers on board included three children. Boater Matthew Evans was one of those rescued. "When I first anchored off, the storm was way out there," Evans said. "It didn't look like a threat at the time. But I started seeing it white cappin'... I figured the safest thing to do was get as close to the rocks because obviously the boat was taking in more water than it can handle." Dallas Fire-Rescue spokesman Jason Evans said all of the boaters wore life vests. In addition to water rescues, several North Texans dealt with power outages. As of 9:05 p.m., the ONCOR outage map displayed 1,000 outages in Dallas county, more than 2,000 customers without power in Collin County and more than 1,300 outages in Grayson County. 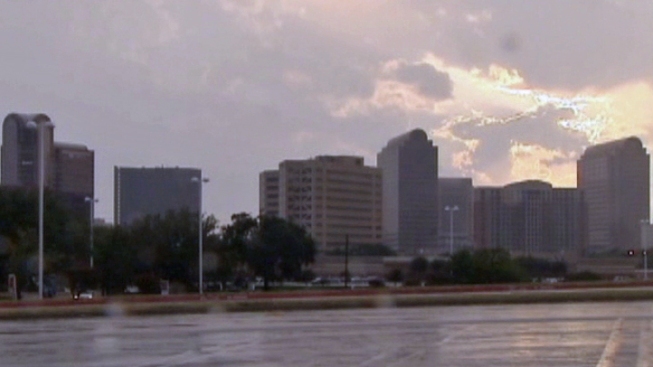 NBC DFW Meteorologist Grant Johnston said high winds pushed out ahead of the storms. The peak wind gust recorded at Dallas Love Field on Saturday evening was 52 miles per hour.